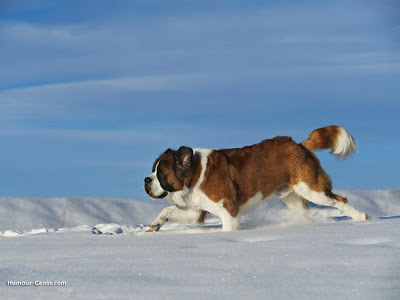 I have met a few Saint Bernards here on Alki and so this week I have decided to write about the beautiful, large and brave Saint Bernard. I hope you enjoy learning about them as much as I have! 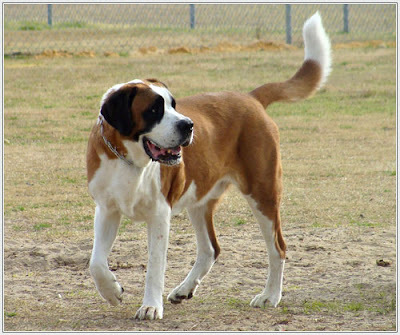 The St. Bernard is a large dog. The average weight of the breed is between 140 and 264 lbs and the approximate height at the withers is 27½ inches to 35½ inches. The St. Bernard is descended from the ancient Roman Molossian dogs of war that accompanied Roman soldiers on their invasion of the Alps. These dogs were crossed with native Swiss dogs and the Saint was developed for hauling carts, guarding and herding. The hospice was founded in 980 AD by St Bernard de Menthon as a refuge for mountain travelers using the hazardous mountain pass between Switzerland and Italy. 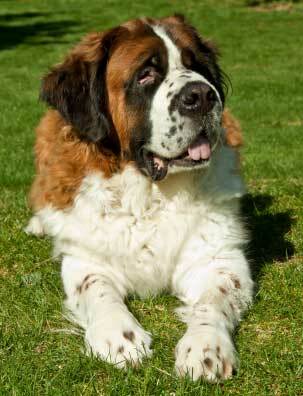 By the 18th century, the monks of the hospice were breeding St. Bernards to guide and rescue mountain travelers. The Saint’s sense of smell is so good that he can find people buried by avalanches under many feet of snow. The breed also seems to be able to sense low frequency vibrations and predict avalanches. During the past 3 centuries, these dogs are credited with saving the lives of well over 2,000 people. "St. Bernard" wasn't in widespread use until the middle of the 19th century. 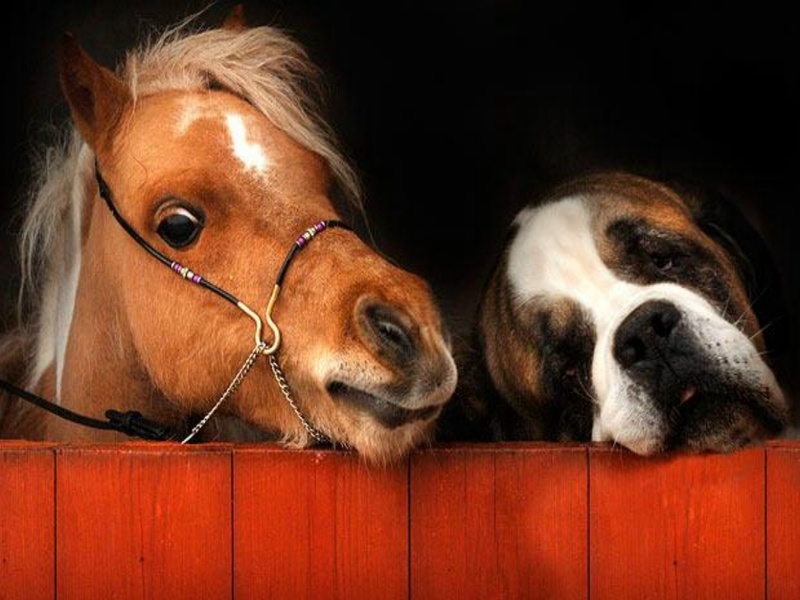 The dogs were called "Saint Dogs", "Noble Steeds", "Alpenmastiff", or "Barry Dogs" before that time. . 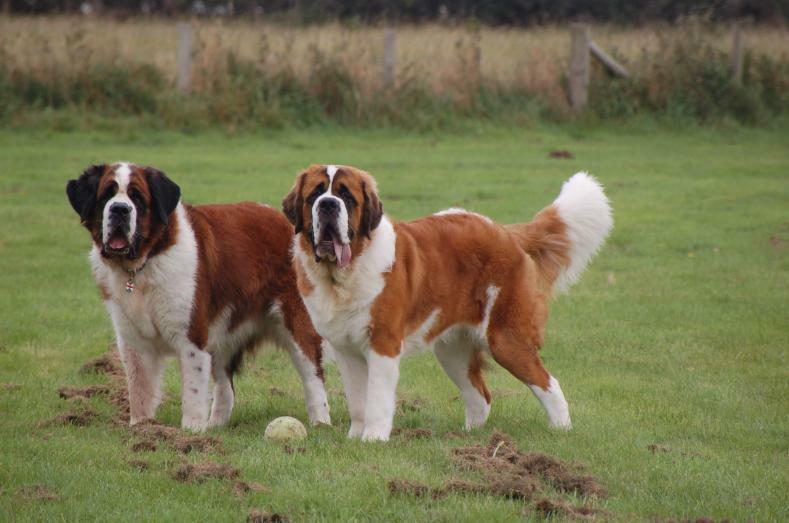 There are two coat types for the Saint Bernard. The coat can be either smooth or rough, with the smooth coat close and flat. The rough coat is dense but flat, and more profuse around the neck and legs. The coat is typically a red color with white, or sometimes a mahogany brindle with white. Black shading is usually found on the face and ears. The tail is long and heavy, hanging low with the end turned up slightly. Sometimes the eyes, brown usually, can be icy blue, nearly white. The Saint is an intelligent, courageous, loyal, obedient and good natured dog breed. Some Saints are extroverts and some introverts but all need close contact with their families. Do not leave this breed outside all the time as it needs to be part of the family’s activities. 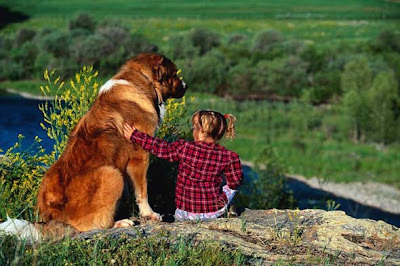 The breed is very good with children and also other pets but because of their very large size, young children and toddlers should be supervised carefully to avoid any accidents. The St Bernard is devoted to its family and will guard it from any threats. The Saint is slow moving, obedient and wants to please its owner and therefore is relatively easy to train. 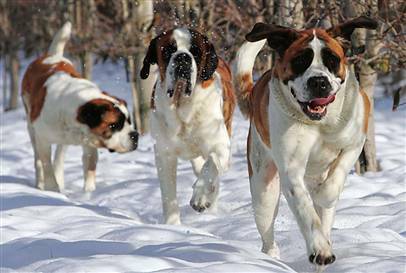 However St. Bernard dogs are so large that they must be thoroughly socialized and trained while they are young and haven’t grown too large to handle. Any giant breed must be thoroughly obedience trained or you will have a disaster in the making. The Saint makes a good watchdog even though it doesn’t bark much and is fairly tolerant of strangers. The Saint Bernard does best with an experienced dog owner. Bamse, a Norwegian dog honoured for exploits during World War II memorial statue in Montrose, Scotland. 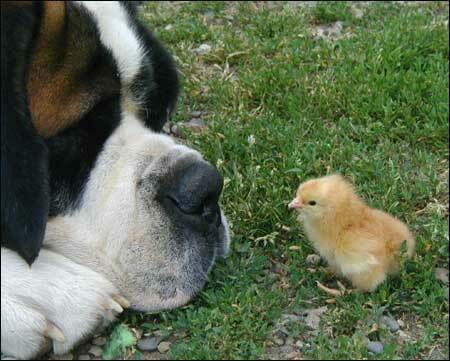 And here is a photo that I really love of a St. Bernard and a cute little friend! 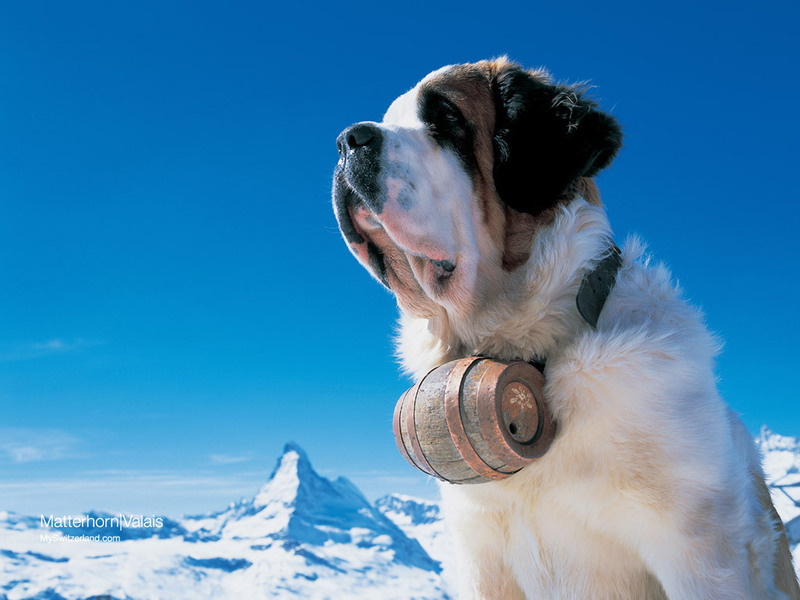 And so from Hero to Beethoven, the St. Bernard is a great dog! Saint Bernards are my favorite breed. I'm so glad you chose them! I learned so much, thank you! Thank you so much Lisbeth! I'm so glad you liked it! Do you have any dog breed that you would like me to feature? Please let me know. I love the photo of the St. and the Mini!! 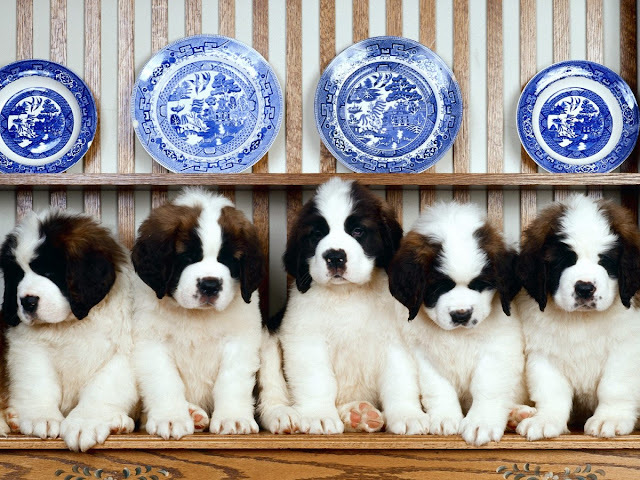 A blue eye in a Saint Bernard is a serious fault, and an almost white one even worse. They are supposed to have brown eyes. I have a saint Bernard female puppy 5week old with blue eyes.